After a few down days the last chase day of Tour 2 started a really quiet period in the Plains when a huge ridge had flexed its muscles from Mexico all the way up the West Coast! But we still managed to chase on Day 10 albeit having to leave the chase just when it was getting interesting. We lunched at a Brewhouse in Emporia which was superb and one for the future tours! HRRR had a line of storms just SW of Kansas City all moving South East in gentle North West flow, I am not a fan of SE moving storms but this would be the start of 2 weeks of this so I thought well you better start somewhere. These were typical Uk type marginal risk storms, generally single or Multicell in nature and quite frustrating to chase, but we made the best of the situation and added Missouri to the chasing list for 2017 but only just by about 10 miles! The best structure came along near the tiny town of Amsterdam where we got some decent structure and lightning. But as we had to be in DFW the next morning we had to leave just as it was getting interesting! Still a storm is a storm and everyone enjoyed just being out there. Below: The last storm of Tour 2 as we wave goodbye to it! This would be on paper Tour 2’s biggest risk of the trip and all the days leading up had promoted near 80f dewpoints and extreme instability. A special Norman sounding sampled 6474jkg of Cape denoting the explosive atmosphere and with 92/80 and ample low level shear the stage was set for long tracked strong tornadoes…….or so we thought! We left Hays and grabbed lunch at the KFC along I135 and headed south into Oklahoma, we went east at Blackwell and sat just east of the triple point, morning models had denoted a sagging boundary over in SW Missouri and extreme North East Oklahoma and this is where the first storms kept back-building, I was not tempted by these hoping something would fire off the triple point and ride under a stationery OFB! At about 6pm after topping the cars off success in the fact our storm had fired, and it went from TCU to 55,000ft in about 20 minutes, now that is explosive, we headed west to take a look and witnessed a barber pole LP Supercell towering into the sky, this was one of these days though where the sky is so soupy that you rarely take pictures and this day followed suit. 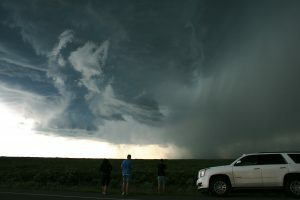 We headed south and watched an area of rotation pass over the road, then took a road across a bridge along with about 100 other chasers and with water both sides was expecting the twister style waterspout to appear complete with flying cows, but alas all we got was sporadic golfball hail. We made it to the town of Chelsea and headed south again to get a look at the storm but by this time it had been absorbed into the ever growing backbuilding line and it was game over! What a BUST! And to give you an idea of how soupy the atmosphere was, when darkness fell and we were surrounded by 3 supercells we could not even see the lightning that evening. Not a chase I will remember in a hurry! 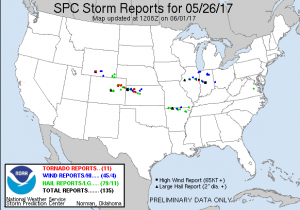 An almost identical day to the 25th but the only difference today was the only player being Upslope Storms. We left relatively early to head towards the Denver area knowing that storms would be initiating by 2pm MDT we would be falling upon an already developed storm by the looks of it. We headed north from Limon on Highway 71 towards Last Chance and watched a few storms lined up in the distance in front of the Rockies. I finally picked a storm and the chase was on, and what a fun chase this was, probably my favourite of Tour 2!! And the fun began at the beginning of the chase as we used some not too normal roads and could have been mistaken for a scene in the film Twister! Rabbit is good Rabbit is wise bellowed over the radio a few times until we finally bumped back onto tarmac again from the tall grass field that was higher than the bonnet of the cars! 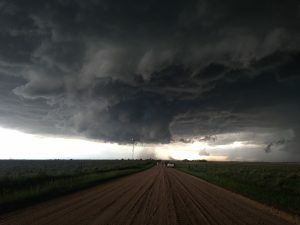 Going X Country did allow us to keep up with a stunning rotating wall cloud though and always be in front of this Supercell who’s structure was perfect for 100’s of miles we chased. So this was turning into a Colorado Structure show instead as the low level shear was just not strong enough today. 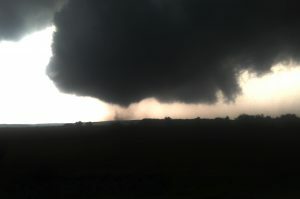 The structure kept coming and getting better as we neared Kansas. After crossing into Kansas dusk was starting to fall so we made sure to get some pictures near our old favourite stopping point in Kanorado along the rail tracks and it did not disappoint again! Thats 3 years on the trot now at that same place. 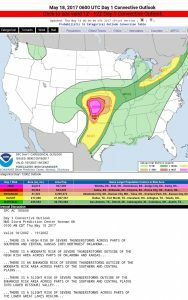 Once it got dark we continued east towards Hays again where we had booked the hotel knowing we needed to get South and East for an expected big day in NE Oklahoma for Sat 27th which was already Moderate Risk! But along the way it always pays to look back especially when you are in the Nocturnal Tornado Hotbed that is Colby/Oakley/Grinnell and Grainfield! 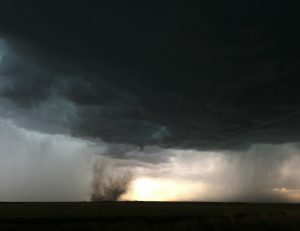 The amount of night-time tornadoes I have seen here is immense! 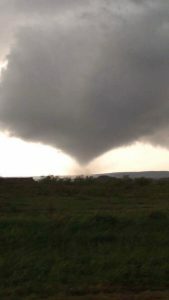 And once again a few Tornadoes dropped and we are pretty sure we have 1 such on camera. 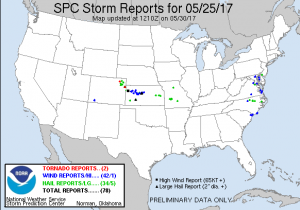 SPC Reports page below! Our storm then split before us making us head south towards Goodland to another great looking Supercell that was moving ESE along I70. 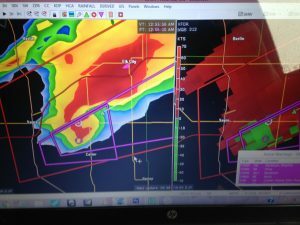 We got to the interstate and pushed on East to Colby with the Storm to our south now Tornado warned as well. We continued to follow this storm but it became very HP in nature which do give off lovely shelf cloud structures but a nightmare to see anything in the action area. 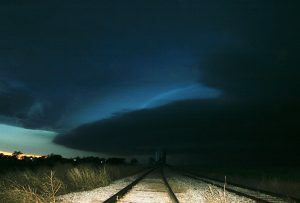 We headed to Hays for the night and awaited the storms to roll through near the hotel. Started today in Dumas with a chase target of between Lubbock and Roswell to Clovis. SPC had a 2% Tornado risk in this area and Supercells were expected with 30knts of WSW Flow atop 20knts of SE flow at the surface. Today really took its time getting going but once it did it was certainly worth it. After sitting near Dora for ages watching a distant storm not wanting to leave the mountains one finally did around 6pm and the chase was on. Our first glimpse at this was of a lovely LP Supercell and we stopped for some structure shots, but my attention was drawn to a pair of Supercells heading on a more SSE heading further west towards Roswell. 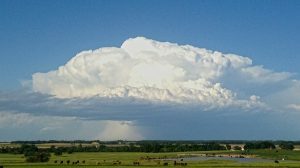 We then headed South West to intercept the bigger storms which had 3″ hail on them and got a look at the furthest west storm which had by now absorbed its little brother ENE of Roswell. 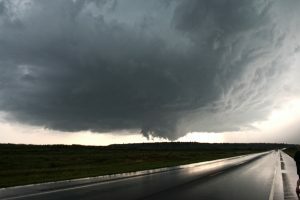 About this time it gained a Tornado warning but for the life of me I dont know how as the base was clearly too high on this LP but the structure was very nice. 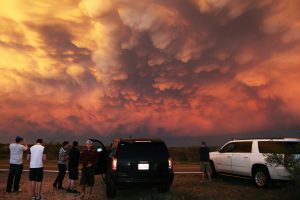 This storm was rapidly shrivelling up due to loss of diurnal heating so I elected to book rooms in Roswell and get west of the storm before she died, the next hour or so was not expected with some of the most beautiful mammatus I have seen whilst chasing in the USA. Watching the base of the LP shrivel up was fascinating as well. All in all a great days chasing! Started today in DFW and got an early 9am leave with the start of Tour 2. 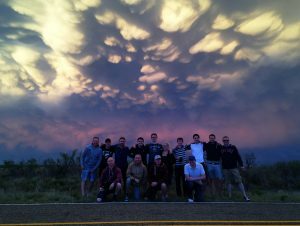 Not many tour groups would commit over 500 miles to a Marginal risk zone in the Oklahoma Panhandle but we mad brits do because you never know what might turn up on these types of days and today was one of those days which out performed what was expected with some great lightning and superb structure. We almost retraced Tour 1’s bonus day with a lunch in Abilene and then headed north through Lubbock and through Amarillo for about 4pm. 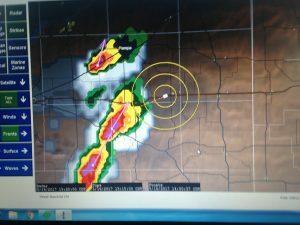 A few non severe storms were rolling out of extreme NE New Mexico and we latched onto the eastern most one near Keyes (Ok). Some great lightning greeted us on this very slow moving storm and it even put on some structure. Ended the day in Dumas in readiness for tomorrow Slight Risk over West Texas and New Mexico. 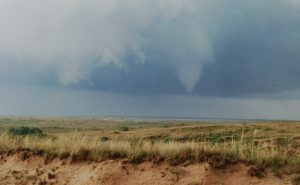 Started today in Enid and it was the last chase day of Tour 1, handed the reigns to Arron today seeing as Tour 1 had already seen 8 Tornadoes already and its always good to let others in my team chase. 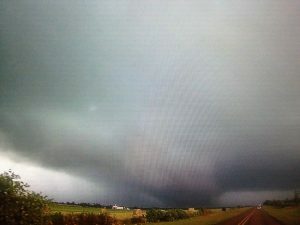 We picked the Lawton area as a target and had a stupidly long lunch in Buffalo Wild Wings (Wont be going there again in a hurry) A broad 5% Tornado area was present today from Western North Texas bending back into Kansas but the area that verified the most was out of most risk areas in a rapidly changing Mesoscale area in Southern Kansas. After lunch we punched through a few cores never really finding the hail today (when you look for it you never find it) and had some bears cage incidents which are always fun, we sat down near the Red River crossing North of Wichita Falls and watched storm after storm heading North East, all of them not looking that great before finally deciding to put some miles between us and the changeover target the next day in Dallas. Had a lovely meal at Montagues Steakhouse which is defo up there with the best steaks we have tasted over in the states before. Ended the day at Decatur watching distant lightning. An amazing end to an amazing tour with incredible people! After spending the 17th as a travel day we awoke in Woodward with the SPC upgrading todays risk to a High Risk with a 30% Hatched area for Tornadoes the most we have seen in the Southern Plains since April 14th 2012!! 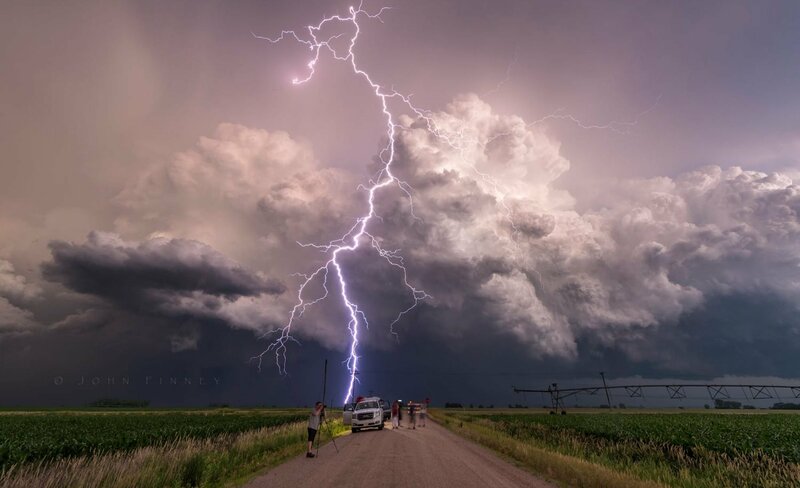 High risk days are always filled with dread from most chasers due to there being a high risk reward/failure type of scenario and this day would also be the same. I awoke very early checking and re-checking everything and with the Twirl team staying in the same hotel knew we were in a very good area to start the day. The morning model runs were quite perplexing showing a minefield with zero cap and numerous supercells breaking out around 18z. The first storms looked like they would go in SW Oklahoma around that time and HRRR & NAM were singing off the same hymm sheet. The dynamics today were up there with some of the best High Risks preceding, temps of 80f and dewpoints of 70f, with 50kts of deep layer shear and clockwise hodographs promoting violent long tracked tornadoes today would be a day to chase conservatively. Outlooks below. We grabbed lunch along the way and headed North of Woodward watching radar and the first Tornado report of the day come in from SW Oklahoma near Duke. A PDS tornado watch was issued for our area and numerous storms were streaming north just like the HRRR showed. All of these were HP in nature and picking one out was proving difficult, around this time I noticed one of the early Supercells down near I40 had become discrete and had an uninterrupted flow into its updraught, it was time to target this storm so we headed off South and east towards Chester (Oklahoma) punching through a tornadic storm in the process which in itself was quite a dodgy process. 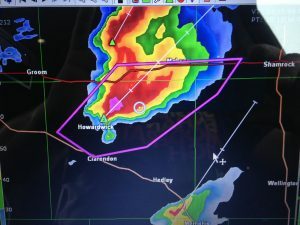 Our target storm was showing itself to our South East and a large damaging wedge tornado was already in progress, from our position we had no visual and at points looking at the radar I was perplexed seeing barley 20dbz reflectivities with this storm. I punched through the northern part of the storm near Boise Junction and sat just east of the precip and then there it was a stunning meso to our west with fast rotation. 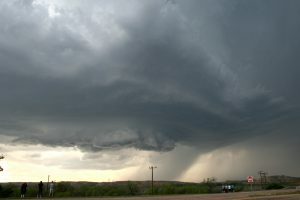 A strong wall cloud was denoted and stunning Supercell structure with very dangerous Cg lightning popping all around us. After cresting the hill the multi vortex Tornado touched down intermittently at various times with one vortex skipping across the road in front of us, the tornado was now just west of Highway 281 and North of Boise Junction so I headed North with the Tornado so it was just a few miles west of us. We followed this north towards Waynoka with various touch downs ripping up trees. 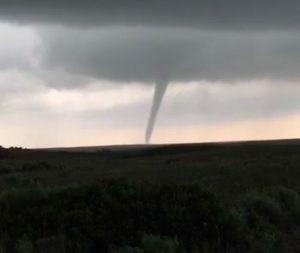 Pictures do not do it justice and as usual away from the High Plains most of these Tornadoes look grungy unless you are in the field next to them. 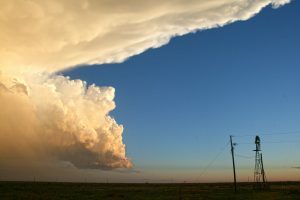 We followed this supercell to the Kansas Border until it looked quite trashy and then headed back south towards Seiling for another couple of Supercells that had initiated along the dryline, these gave us some lovely pano pictures before sunset but the tornado threat was always low with these later storms. We finished the day in Enid eating at 5 Guys and celebrating another successful chase day on what was a very tricky High Risk. Last day of tour 1 coming up tomorrow for the 19th before the changeover at DFW. Woke today in Dumas with a Moderate Risk in front of us, the Tornado probs had been raised to 15% Hatched with 45% on the wind and large hail. The HRRR was promoting 2 areas of Storms, an early area roughly around the Dumas area heading North East into SW Kansas and a secondary area initiating around 4pm CDT from off the Caprock escarpment heading eastbound into Western Oklahoma. After some fine tuning I chose the 2nd option due to better synoptics further East and we picked Shamrock as a chase target. 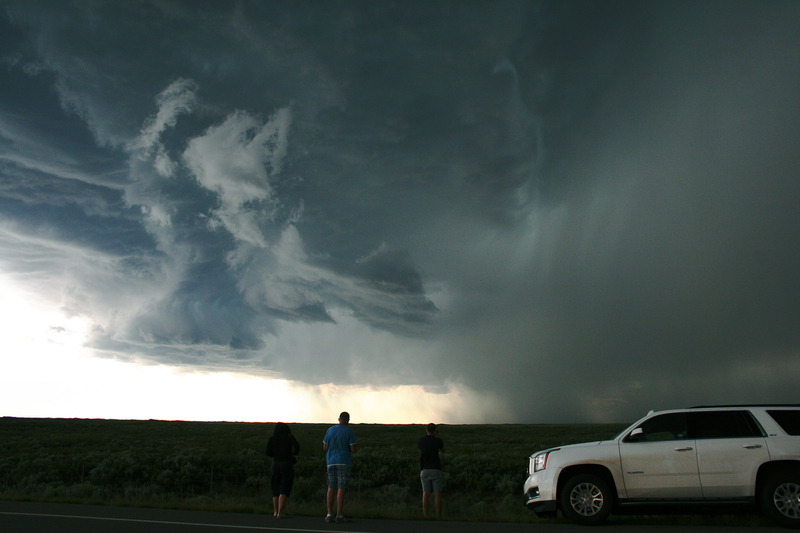 Whilst waiting in the Mcdonalds car park with so many other chasers that day things were coming together very nicely and a pair of Supercells initiated near Clarendon so we headed to Mcclean to watch. 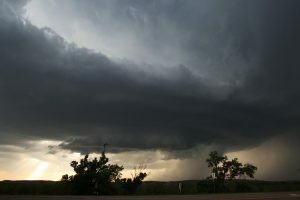 A stunning Classic supercell about 15 miles to our south west was rolling towards us and it looked perfect with those low LCL figures we had today, it quickly gained a tornado warning and it just had that look to it that we have seen so many times before. 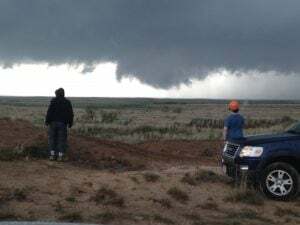 We took a dirt road south at McClean and watched a strong rotating wall cloud approach, I believe the first touch down occured just south of us before the main cone tornado touched down to our east. 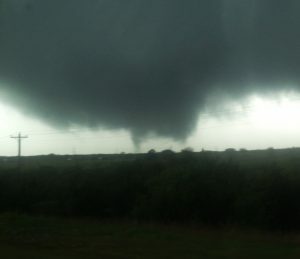 From the west it looked stunning though as a ghostly white cone Tornado. Success and the first tornado of the day. 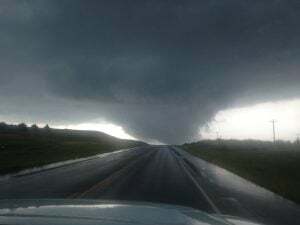 After this tornado occured it took us quite some time to catch back up with the storm due to flooded dirt roads and it took some amazing driving from my team to keep us from ditching the cars. 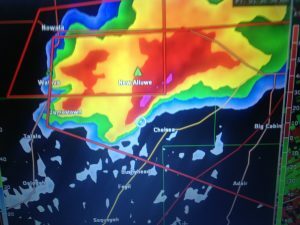 We got to Shamrock again and then headed North towards Wheeler where we briefly caught up with the large wedge tornado to our north. 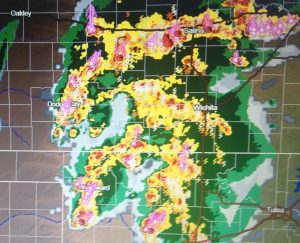 The storms after this grew upscale into a damaging bow moving east so we headed south to Lawton for the evening in readiness for more storms that had initiated along the dryline further south west and let them impact the hotel. 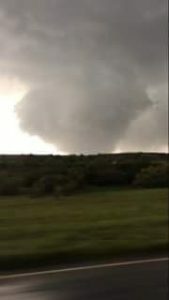 All in all happy with the outcome today scoring 3 Tornadoes but sad with the impact of the Elk City Tornado that claimed 1 life today. Started today in Amarillo with another Slight Risk in the Texas Panhandle and also the day 2 showing a Moderate Risk in much the same area so a busy few days coming up. After heading north towards Dumas convective Initiation followed at 3pm CDT. There was a problem today with the lack of Cap and we positioned ourselves on the moisture gradient near Stinnett and watched the first 3 or 4 Supercells all race north towards the Oklahoma Panhandle and did not get tempted by them. Around 5pm another Supercell initiated NW of Amarillo and started to right turn towards the Stinnett area. 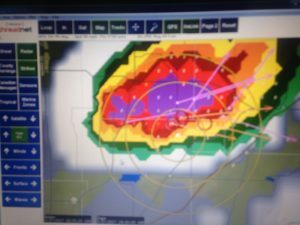 This was our storm and we waited and watched some really nice structure starting to take shape to our SW, around this time 3″ hail was being reported so we hastily wnt south towards Oil City and sat just SE of the now Classic Supercell. Rotation picked up briefly but was never strong so was not expecting much in the way of tornado possibilities with this storm. 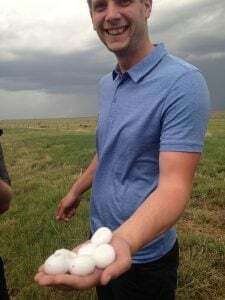 After hearing of the large hail reports we went back north to be on the west side of the Supercell at sunset and crossed the path of the large hail where we picked up some decent sized stones. Picture below is of Arron holding some of them. We retreated to Dumas for the night after this so we could be all refreshed and ready for the expected big day ahead on the 16th!